We had a simple goal: Have our own workspace to build cool cars. We had simple constraints, too: time and money. 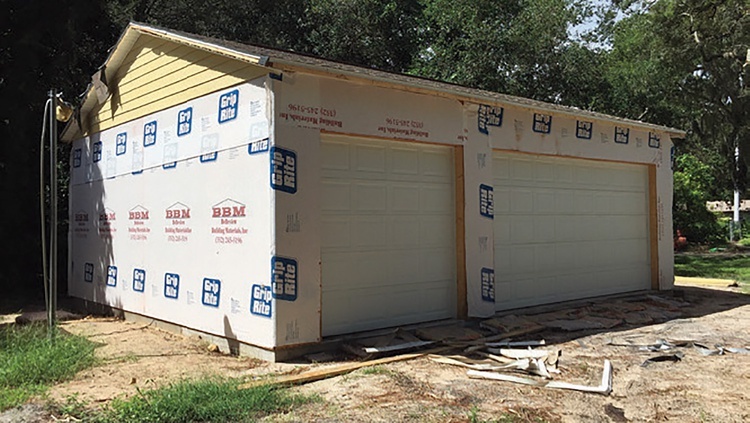 That’s why, after the heavy dose of planning detailed in our last installment, we wrote a $20,495 check to Master Garage Builders and marked a date on our calendar: garage delivery day. 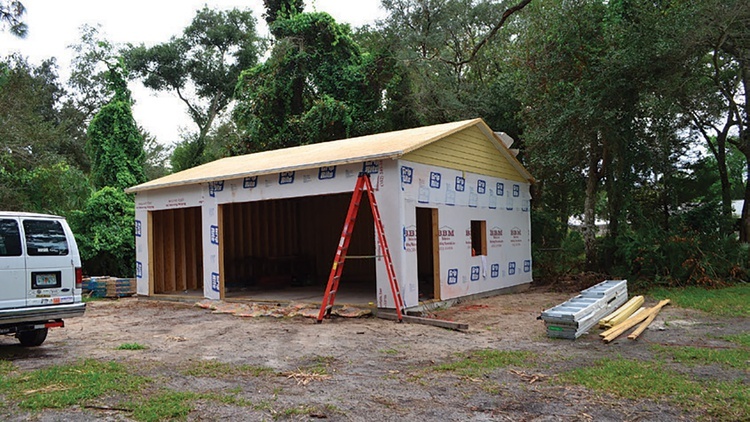 Master Garage Builders would assemble a stick-built garage kit for us before delivering it right to our backyard. We’d be waiting there, our capable hands ready to assemble the pieces into our own workspace. Well, capable or not, our hands would be there. We’re metal workers, not carpenters—but how hard could it be? Our garage needed a home, and we had one for it in the backyard. Unfortunately, we had to get rid of a tenant first: a giant oak tree. No amount of clever site planning or repositioning could avoid placing the garage on top of that tree, so we begrudgingly called a tree crew to remove that oak as well as another that was leaning over the house. The cost? That set us back $2000, but we only deducted half of that from our garage-building budget since only one tree was removed for the project. While we’re not scared of a little tree work, we didn’t want to risk life and limb climbing a rotten oak tree. 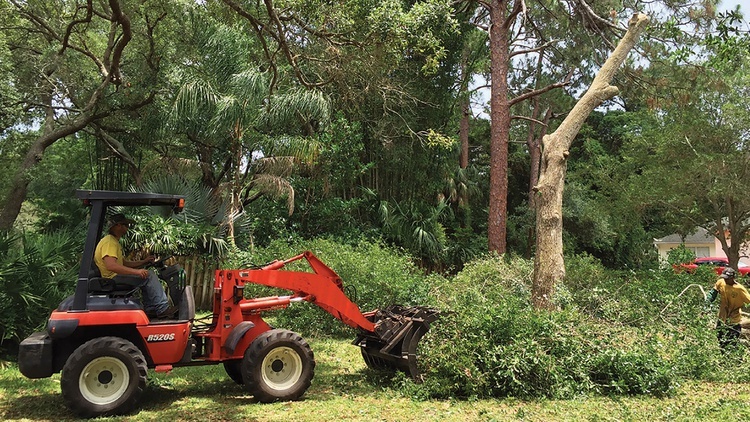 Calling a professional tree service meant that we’d safely keep our feet on the ground. It saved time, too: It took one day for the professionals versus the string of weekends we would have required. Also consider the cost of an upgraded chainsaw, Bobcat rental, stump grinder and dump trailer. Once the tree was gone and the stump removed, we had a nice, flat, empty backyard. We could move on to the hard part. Walls are no good without a foundation, so we needed to lay one before the garage was delivered. 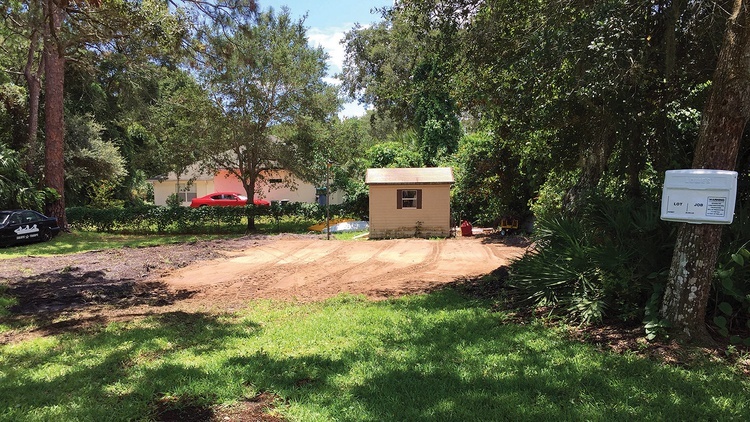 Since we were building in Florida, that meant digging footers and pouring a reinforced concrete slab. A few problems: We don’t own a skid-steer loader, we don’t have a concrete crew, and bending rebar takes time that we didn’t have. Concrete isn’t rocket science, but it is hard, grueling work, and once it sets, it’s set. There are no second chances. Just like that, company owner Stacy Szczygiel rattled off exactly what we’d need and gave us a quote: $5500 including the site prep plus forming, pouring, pumping and all materials. 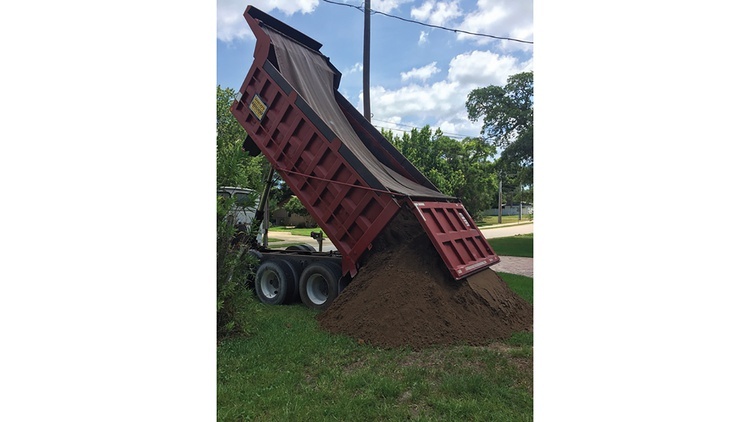 We just needed to provide two dump trucks of fill dirt, preferably sitting in the front yard. Sold! We’d later learn that Seagull pours a few slabs per week for Master Garage Builders, so they were already familiar with our construction requirements. Unless you live in Florida, though, you probably won’t be able to convince Stacy to pour your slab. 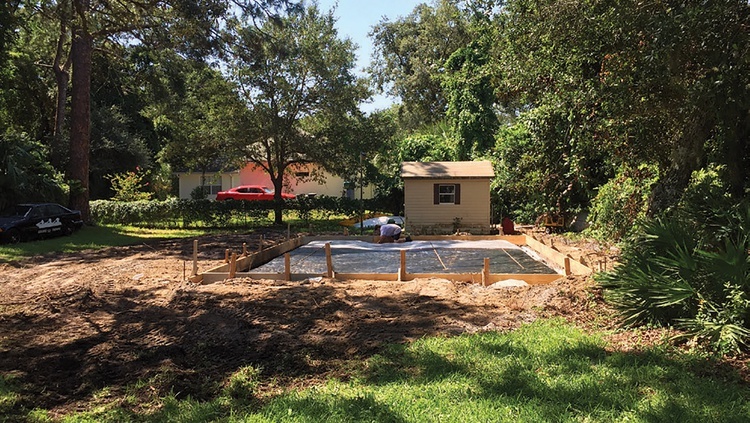 Make sure you go over your plans with your own friendly neighborhood concrete contractor, as it’s quite difficult to add the correct footers or anchors after the concrete has hardened. A few days after shaking hands with Stacy, he was wheeling his Bobcat around our backyard like a maniac. The pile of dirt in our front yard slowly disappeared, and before we knew it there was a fully formed construction site out back. Though modern, high-pressure concrete doesn’t need to be thicker than 4 inches for our planned two-post lift, we asked Stacy to plan for 6 inches of concrete beneath our lift’s anticipated location. Then, the big day finally arrived. A concrete truck showed up, as did Stacy, his Bobcat and a full crew. Access to our backyard is tight for a big truck, so a special pump had to deliver the concrete from the street. That added a few hundred dollars to the project’s cost. At the end of the day, though, we had a beautiful foundation for our incoming garage kit. This was another area where expert help paid off, as we simply didn’t have the equipment or manpower to match a professional’s work. Finally, we were ready to accept that 24×30- foot garage kit we discussed in the last installment—or so we thought. A piece of the puzzle was still missing: a reach forklift. We’ll go on record as saying forklifts are some of the most fun (and dangerous) things we’ve ever played with. Wouldn’t it be cool, we thought, to buy a forklift on Craigslist for a few grand, use it for a few months, tip over a few cars just for fun, and then sell it for roughly what we paid? Unfortunately, reality didn’t quite match up with our imagination. We couldn’t find any running forklifts for less than about $10,000, with decent examples going for about twice that. Then we looked up how much one of those things weighs. Answer: more than our open car trailer could carry (by a factor of five). Time for plan B: renting. We scheduled a forklift rental through a local company for about $300, but then they called the day before the play date with bad news: Their machine broke and wouldn’t be fixed for a week. Oops. Plan C involved spending more than $300 to rent from a national company on short notice. Either way, did we mention how much fun giant forklifts are? We didn’t want to go into the wall-lifting part of this experience cold, so we spent the evening before garage delivery day driving around the yard and getting familiar with the machine. We picked up random objects and tried things we saw on YouTube. We even showed off our new skills by using the forklift to pull a few weeds. 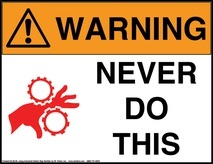 Wall, What Are You Waiting For? We called a few friends, our neighbors and our dad. Our pitch was simple: “Want to watch a giant forklift pick up a building?” That was enough to get five helpers on site for setup day. And, surprisingly, it all went as planned. 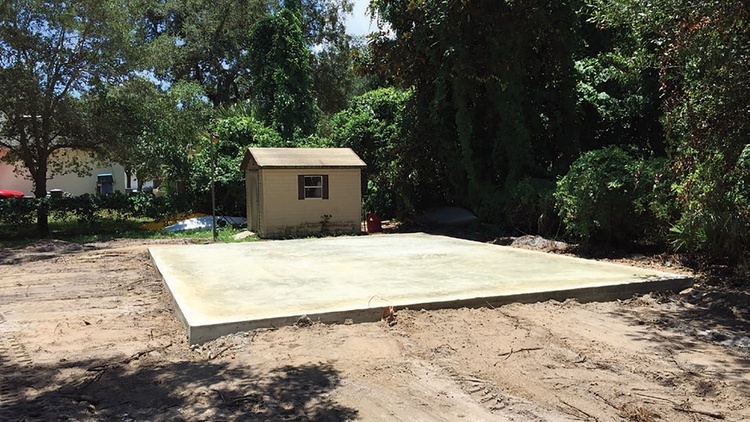 We marked a big rectangle on our concrete slab, picked up the walls one-by-one, and set them down in the shape of a garage. After lots of hammering, some concrete drilling, and emptying two full coolers of Gatorade, we’d successfully built the basic structure of our garage. We duct-taped a work light to the forklift’s boom and worked until midnight that first day installing the trusses. 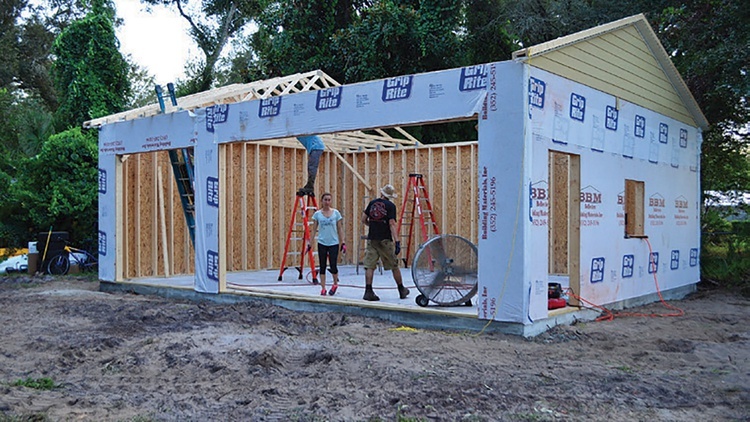 We’d built the basics of a garage, but it wasn’t ready to keep anything dry yet. We needed a roof. While the garage kit came with everything needed to install a roof, the shingles weren’t nailed in place. 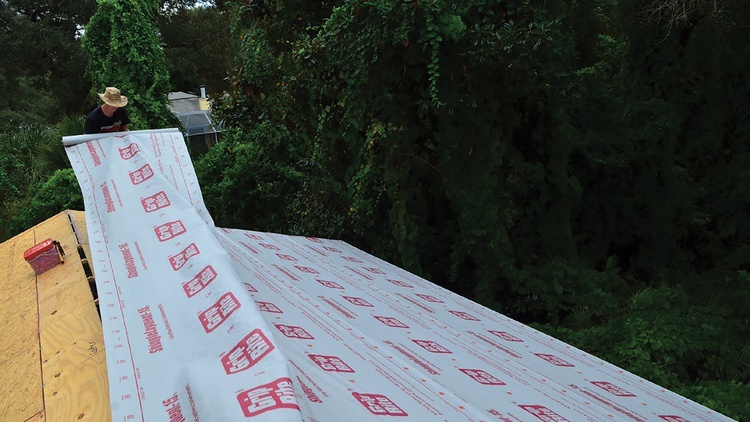 Most people would probably call experts at this point, because roofing (like concrete work) honestly isn’t much fun. It’s also usually a task for at least 10 people–especially in Florida’s summer heat. Roofing work is expensive, but the tools are cheap and we were willing to do the job ourselves if we spaced it out over a few weeks. We bought a Harbor Freight nail gun and a big tarp so we could cover the building between work sessions. Then we spent about a month nailing decking, then flashing, then underlayment, then shingles and finally soffit panels. It wasn’t fun, and all of our gullible roof-climbing friends agreed. But at least our shop finally had a real roof. Then we got lucky. One day we noticed a neighbor getting some gutters replaced. We walked over, palmed a few bucks to the guy running the truck, and just like that we had a new gutter for a fraction of the normal price. Our shop kit came partially build. 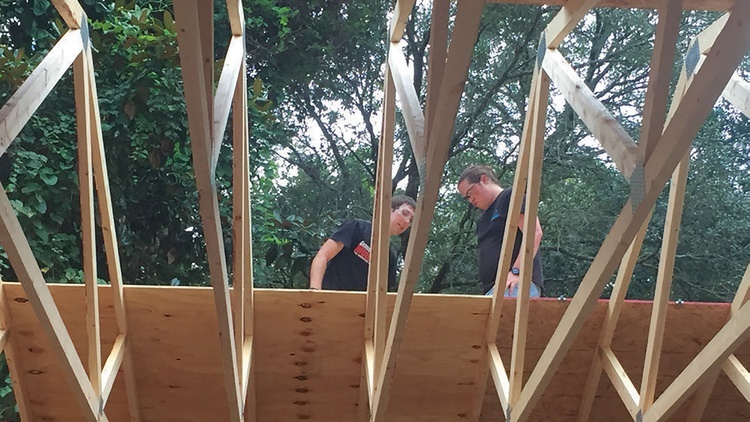 We didn't need to assemble the trusses from scratch, for example, but we did have to position each one and nail it all together. Next step: nailing on the hurricane bracing, which in Florida is non-negotiable. Again, the necessary materials were all included in the garage kit. 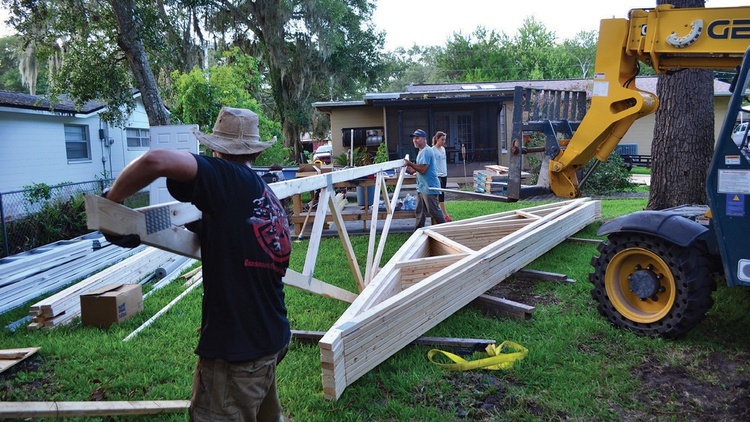 Every state has different requirements, but in Florida there are two main kinds of hurricane bracing: 2×4s in the attic that keep the trusses from racking under high wind loads, and metal straps on the walls that keep the roof from blowing off. We used both in order to meet code. How'd we control our budget? By doing our own roof, windows and paint. It was a lot of work, but it also saved us a lot of cash. 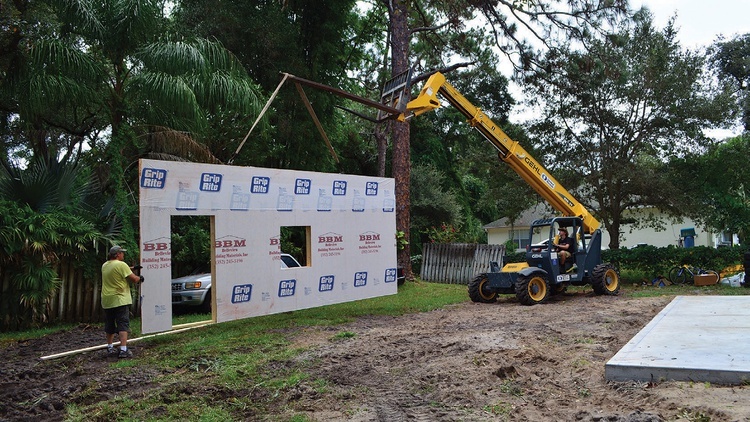 Our garage had walls, a roof, and bracing to keep it all attached. Next step: doors. We installed the pedestrian door and window ourselves, but called a local company to install our two big garage doors. Why? Two reasons: First, there was a hurricane approaching and we didn’t have time to do it ourselves. Second, garage door springs are terrifying. 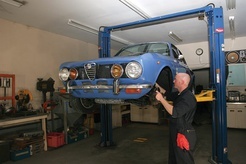 We’d planned to do our own garage door installation and then pay a company to come in and wind our springs. But as we evacuated our home to escape the storm, we were glad to have shelled out $500 to leave behind an enclosed garage. This was a great example of how life can flat out get in the way sometimes, unexpectedly dinging our budget but probably keeping our garage from blowing off its foundation. It was still in great shape when we returned. With the storm passed it was time to get back to work, so we turned our attention to the siding. The walls came with the sub-siding and house wrap already installed, but attaching the actual siding was our job. 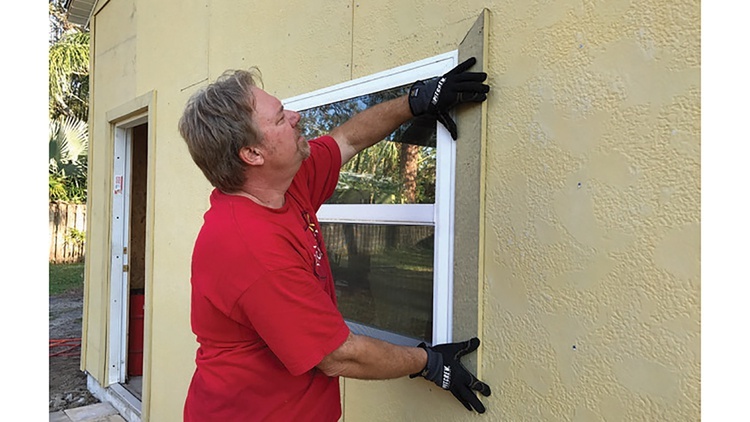 The kit came with a few different siding options, but we chose HardiePanel fiber cement siding in a stucco texture to match our house as closely as possible. Installing the siding wasn’t mentally challenging, but it did take a lot of nails and time. We trimmed the garage with HardieTrim boards and then caulked every joint to keep water out of the building. We’d built the shell of our new workshop. Now we just needed to paint it. We simply used what was left over from the last time we painted our house. We just needed to pick up one more gallon. 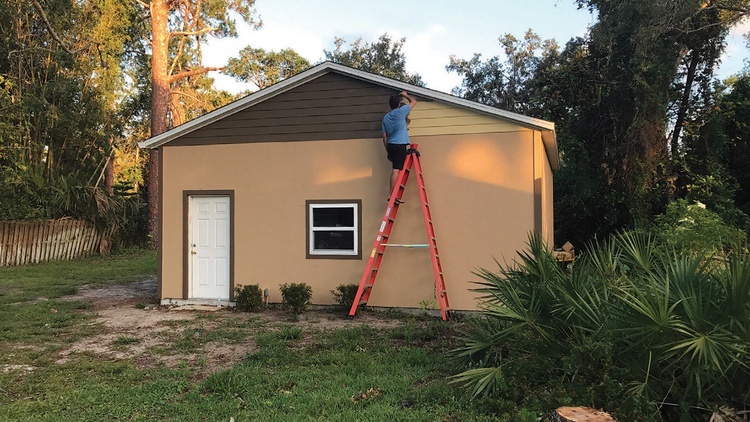 If we didn’t have that leftover paint, we would have gone a different route: Most home-improvement stores sell improperly mixed paint for a few bucks a gallon, and we figured that we could mix some together and just paint the building brown. Throw in another abandoned gallon for the trim, and nobody would ever know we had painted our garage for pennies on the dollar. But with the painting complete, the real work had just begun: We still needed to finish the inside of the building and turn it into a workshop. We’ll tackle that project in the next issue. Yes, we hired a few experts at certain points. Doesn’t that go against the “build your own garage” goal of this project? In our opinion, no. Part of being a general contractor, which is what we were for this project, is knowing your strengths and your limitations. Plus, don’t forget that you can always haggle–we saved thousands of dollars by doing so. How did we decide whether to do something or hire it out? We followed a pretty simple formula: Add together the required materials, tool rentals/purchases, extra hands and potential for messing up. Then factor in time, which we didn’t account for exactly but rather used as a tie-breaker. If the result was anywhere near the quote given by a professional, we figured it was time to pay the experts. 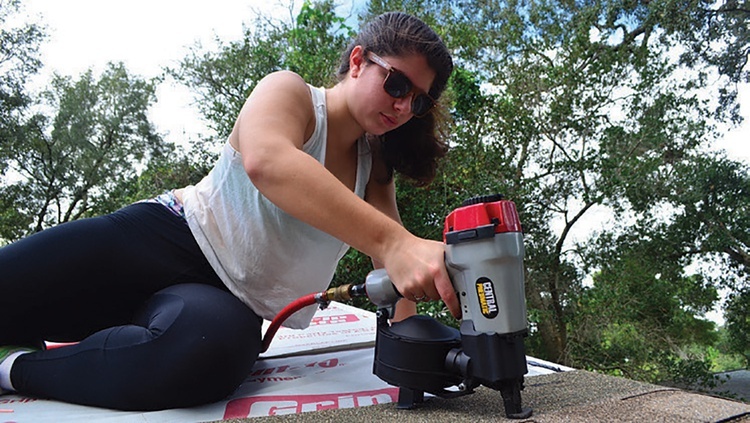 That formula told us that we’d be fools to try pouring our own concrete slab, for example, but installing the roof ourselves seemed to make sense.